Johnson County is home to the famous “Snake 421 Motorcycle and Sport Car Route” that travels 489 curves over two mountains and through one valley. The route has something for all types of riders. There are challenging sections and some peaceful stretches. It meanders along flowing creeks in a national forest, has tight curves on winding roads and has sweeping curves through rolling farmland. 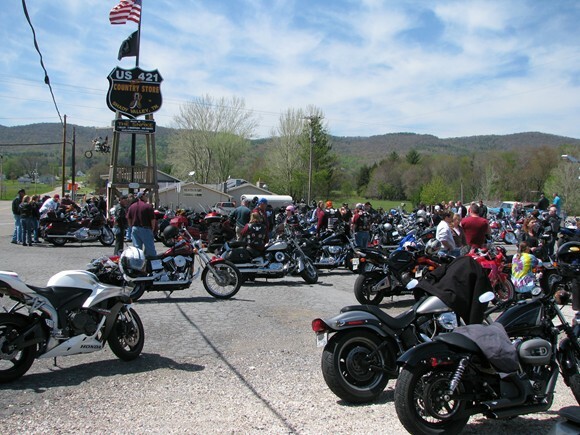 The Snake provides some of the best motorcycle touring in the southeastern United States. There is actually a series of rides that are collectively known as “The Snake”. There are three different Snake Rides that travel through our county. There is the “Snake 421”, “The Best of the Snake” and “The Green Eyed Snake”, with all of these rides passing through the main intersection of US Hwy 421 and TN Hwy 91 in Shady Valley, Tennessee. Here you will find the Shady Valley Country Store that serves as the hub of the Snake Rides. The store provides Snake merchandise, drinks, food and fuel.